Jaycee Parker marries Jericho Genaskey Aguas today, August 19, at the King's Royale Promenade in Bacolor, Pampanga. Jaycee Parker evokes rock and roll glam for her bridal look today, August 19. 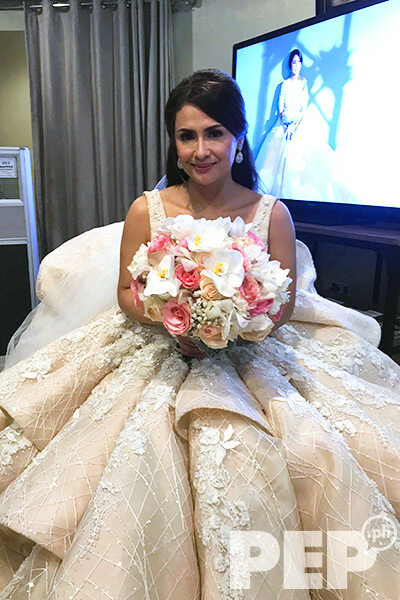 The actress marries Angeles City Councilor Jericho Genasky Aguas in a wedding ceremony at the King's Royale Promenade in Bacolor, Pampanga. Jaycee dons a custom design by Pampanga-based designer Jojo Macapinlac. In an interview with PEP.ph (Philippine Entertainment Portal), Jaycee describes Jojo as "one of Pampanga's best desingers." Completing her bridal look is makeup artist Mariah Santos and hairstylist Arvin Santos. NOW HAPPENING: After four years of being together, Angeles City councilor @soulofjerichoaguas and actress @iamjayceeparker finally tied-the-knot. Hubert Aguas, Jericho’s son with the late actress Isabel Granada, performed Nathan Sykes and Ariana Grande’s song “Over And Over Again” for the bride’s wedding march. Jaycee and Jericho celebrated their fourth anniversary as a couple yesterday, August 18, a day before they exchanged "I dos." In an Instagram post, Jaycee wrote a sweet message to her now-husband. "Thank u for being the man of my dreams! "I know our union will be blessed because God is in the center of our relationship. "Kapit lang tayo.. together we can achieve anything our heart desires... I love u so much and I will forever be grateful to you!"